This year, the culinary stars have aligned in unique fashion. 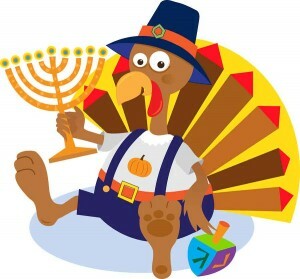 Not only will we be celebrating Thanksgiving in late November, but as we indulge in piles of turkey and pie, the Jewish Festival of Lights will be in full swing. This provides the ideal opportunity to bring traditional, Thanksgiving and Hanukkah favorites to the same table. After all, it will be another 70,000 years before we get the chance to do it again. Personally, I am looking forward to enjoying some golden-brown latkes with fresh cranberry sauce. This brings us to an important question: Why on earth are potato pancakes consumed on Hanukkah. To answer this question, we must rule a few things out. The reason has nothing to do with the incredibly witty Adam Sandler song, Judah the Maccabee, or even the fabulous game of dreidel. Latkes are, in fact, consumed for the incredibly healthy reason of being fried. In honor of the festival of lights, Jews across the lands consume oily favorites like potato pancakes and fried jelly donuts. Essentially, the oily foods are supposed to serve as a reminder of the miracle of the oil found after the Hasmoneans defeated the Greeks, which lasted for eight days, even though it should have only lasted for a single night. For more information on the miracle of Chanukkah, visit Chabbad.org. Now, back to the delicious idea of potato latkes and cranberry sauce. 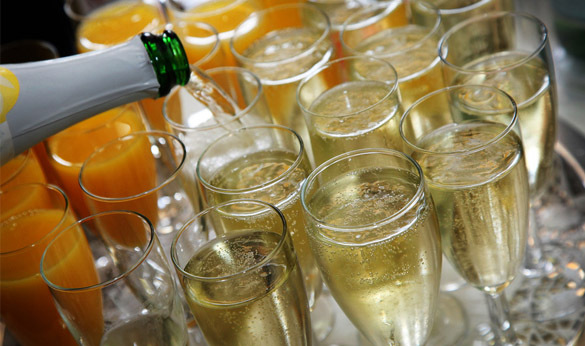 Much like the menu for Thanksgiving has changed over the years, so has the Hanukkah menu. Luckily, two of the most delicious side dishes are included in these holidays and we will have the opportunity to indulge in them both simultaneously. In light of this holiday miracle, I have included two tried-and-true recipes to join you at the table on November 28. Call it a Chanukkah celebration or Thanksgiving; just don’t leave out the latkes and cranberry sauce. Depending on where you are reading this from and who your grandmothers are, you will likely pronounce this holiday favorite differently. Luckily, if prepared properly, they should all be the same in one way: DELICIOUS! There are a few tools essential to proper preparation: A good-quality grater, a large mixing bowl, and a deep cast iron pan. If you are lacking any of these essential tools, try one of these below. Once you have collected the proper tools to make delicious latkes, you will need the right recipe to create latke genius. 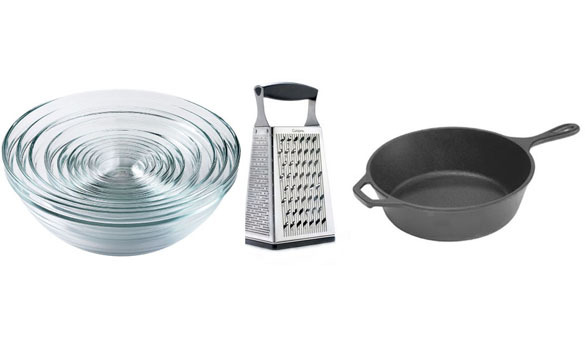 Begin by peeling and grating all the potatoes and onion with your large-hole grater. Next, wrap the potatoes in cheesecloth and ring out the excess liquid. Once you feel you have removed as much liquid as possible, continue to ring the potatoes out further. Combine potatoes, onions, eggs, cornstarch, and preferred amount of salt and pepper in a large mixing bowl. Stir until all ingredients are mixed well. Form the mixture into palm sized pancakes and carefully place into cast iron skillet. Allow to brown on each side for one to two minutes. Once you have reached a golden brown color, remove from pan and place onto cooling rack. 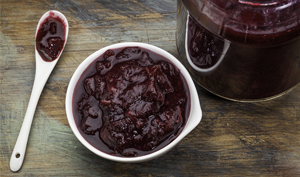 Serve with cranberry sauce, sour cream, and chunky apple sauce. 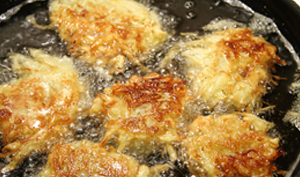 Instead of placing your cooked latkes on a plate with paper towels, place them on a cooling rack to allow the excess grease to drip off. This will make for a much crispier final product. Combine all ingredients in a sauce pot and bring to a boil. Allow sauce to lightly simmer for 10-15 minutes. Be sure to stir every few minutes to guarantee the mixture does not stick to the pot. After 10-15 minutes, remove from heat and allow to stand for 10 minutes before serving. This sauce can be serve cold, room temperature, or hot. Very happy Thanksgivikuh to all!